“Ich bin mega happy” (I am very happy). This was what Fabian Cancellara had to say in an interview while en route to the 2008 Milan-San Remo. As the reigning World Individual Time Trial Champion, Cancellara had already notched up four significant wins in a season that had barely gotten under way. Yet later that day (March 22nd) he was destined to claim one of the biggest wins of his career. Fabian does indeed have much to be ‘mega happy' about. In a year of endless negative headlines for cycling, Fabian Cancellara stands out as a positive example of everything good that cycle sport can be. At 1m 86cm (6'1”) and 80kg (176 lbs. ), he is a big man with a big engine. In some ways he reminds us of ‘Big Mig' Miguel Indurain. Like Indurain, he is a quiet man with an incredible natural ability that translates into world beating time trial skills. His successes include two of the ‘Five Monuments' (Paris-Roubaix and Milan-San Remo) and eight time trial World Championships. To date his career grand total of wins stands at 46.
wheel. Together they had two meters on the next man but this was enough for Cancellara. The Swiss rider got out of the saddle and sprinted away from the Spaniard. As so many riders have learnt, you do not give the Swiss World Time Trial Champion any space because once you do it is impossible to close the gap again. In full view of the frantically chasing riders, Cancellara turned on his best time trial engine and powered home to a fabulous win by four seconds over Fillipo Pozzato (Ita) in 2nd and Philippe Gilbert (Bel) in 3rd. Within cycling there is controversy over the use of race radios and CSC certainly makes full use of this technology. We can be sure that Bjarne Riis was back in the team car directing his troops and making sure that his star rider was both well protected and well placed. But when it came to the final moment of truth in the streets of San Remo it was clear that Fabian was not listening to the radio. In a pre-race interview he stated that when you are in a lead group you never know what the right tactic is. It comes down to instinct. Based on his race results it is clear that Cancellara is blessed not only with the brute strength of a time trialist but also with the intelligence and a natural ability to ‘read the race'. As Cancellara said after the race “my attack came from the gut”. Many riders with specific skills usually end up slotted in a particular niche. Prologue specialists, climbers, rouleurs, time trialists and so on. Looking at Cancellara's race winning history it is tempting to call him a time trial specialist with stage race Prologue ITT's as a sub-speciality. Indeed his very first race in 2008 was the Tour of California Prologue which was just 3.4km long. He blitzed that at 51.4kmph and in so doing beat ‘Mr Prologue' Bradley Wiggins by four seconds. His race winning time was a scant 3m 51s. By stark contrast, from one of the shortest races of the year, to the M-SR which is the longest at 298kms, it took 7h 14m 35s of saddle time to reach San Remo. Anyone who has raced a bike will instantly understand the pure talent of someone who can straddle that spectrum of racing challenge. Time trial specialists are generally considered to be riders that favor smooth ‘drag strips'. Anything that disrupts their focus and jars their smooth transfer of power through the pedals usually destroys their rhythm. If this truism stands firm for most experts against the watch, then Cancellara should not be a rider for the Northern Classics. Yet in 2006 he dominated the hardest of them all, the Paris-Roubaix. And he did not bide his time until the final kilometers. In this race he forced the pace along the feared stretch of cobbles through the Forest of Arenburg. His tempo shattered the field and as they left the forest only 16 other riders had managed to stay with him. At this point there were still 100kms to race. The final round of hostilities took place on the legendary stretch of cobbles through the Carrefour de l'Arbre with just 17kms to race. Vladimir Gusev (Discovery) attacked, Cancellara went with him and then quickly dropped him. In a flash he had 30 seconds on his pursuers and by the time he crossed the finish line on the Roubaix Velodrome he had 1m 30s on the second placed rider. Again anyone who has raced, especially over the cobbles of Flanders, will understand what an achievement it is to win a race such as Paris-Roubaix. When Cancellara won the “Hell of the North” in 2006 he was the first Swiss rider to do so since Henri Suter in 1923. For Switzerland the last Milan-San Remo win was in 1987 by Erich Maechler. For a small nation such wins are naturally recognised with great pride and today Cancellara is undoubtedly a national hero. His journey to international fame started in 1998 when he won the Junior Time Trial World Championship in Valkenburg. Still as a junior he won the World ITT Championship again in 1999 in Treviso. By 2000 he had graduated to the U-23 Espior category and yet again he claimed the ITT World Championship. He turned professional in 2001 and wearing Mapei colors he won the Professional World ITT Championship. The following year saw many wins primarily in stage race time trials. In 2003 he moved to the Fassa Bortolo team where he stayed through 2005. 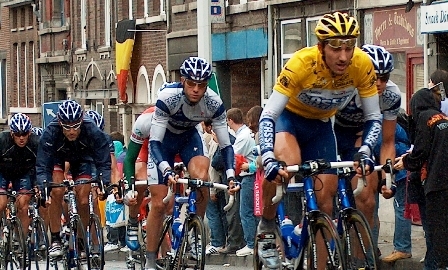 His first taste of the Tour de France came in 2004 which saw him announce his arrival in grand style by winning the Prologue Time Trial and then holding on to the Yellow Jersey for two days. The following year saw many solid performances but no significant wins. That all changed in 2006 when he moved to CSC and under the influence of the all-conquering Bjarne Riis. The absolute high points of that season were his Paris-Roubaix victory as well as a return to the rainbow jersey in the ITT in Salzburg. 2007 saw yet another ITT World Championship as well as another win in the TdF Prologue in London. Numerous other wins and solid top ten performances rounded out a spectacular season. This brings us up to 2008, which already is no less spectacular than previous years. In February his Tour of California Prologue win quickly announced his intentions for the season. The form gained during that stage race immediately paid off in Italy where he won the Monte Paschi Eroica. This new race (only in its second year) is rapidly gaining momentum as a new ‘classic'. Run over dry unmade, back roads of Tuscany, this race is Italy's version of the Paris-Roubaix. And like P-R this race is not meant to be for a rider like Cancellara! After Tuscany Fabian and his team took on the Tirreno-Adriatico where he won the stage 5 time trial of 26kms from Dave Zabriskie (USA). This win gave him the leaders jersey which held held on to until the finish two days later. Obviously in excellent form Cancellara headed for Milan and his destiny to claim his second win from the fabled “Five Monuments”. While Cancellara may have ignored the rules of the stereotype it could be that limitations will prevent him from becoming another Eddy Merckx or Bernard Hinault. We may never see another Grand Champion who can win anything and everything. For Cancellara his achilles heel seems to be the big climbs. However that being said it is possible that, like Miguel Indurain before him, he will learn to survive the big mountains. His progression through the classics and now his first major stage race win (Tirreno-Adriatico) show that he is still developing. Destroying stereotypes seems to be a Cancellara speciality and at 27 years of age he still has time on his side. It would be fabulous for his fans and cycling in general should he resurrect the concept of riders like the ‘Cannibal' (Merckx) and ‘The Badger' (Hinault). History shows us that great people are rarely recognised for their unique stature during their own lifetime. In time Cancellara will be remembered as a cycle racing legend. But for now he is a committed champion just doing his job and in the process making his ever growing legions of fans “mega happy”. With the onset of spring the cycling world eagerly awaits the battles of Flanders, P-R and L-B-L before the warm summer sun ushers in the Grand Tours. See the CyclingRevealed elite racing calendar for all the most important 2008 dates HERE.